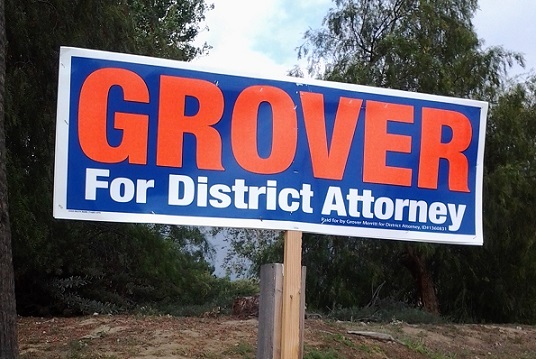 The latest out of Upland City Hall consumes Friday’s column. The city manager is retiring June 30, but almost everything about his departure, announced Tuesday, raises questions. I list the ones that occurred to me and try to answer them. 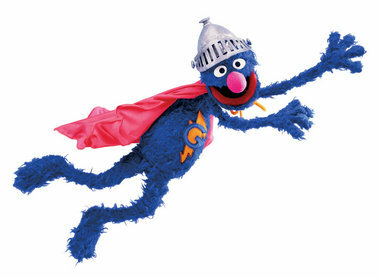 Wednesday’s column is a rarity for me: a celebrity interview. I chatted by phone with Terri Nunn, frontwoman of the band Berlin, with some trepidation. Would this work as a column, or would it end up being merely a promotional piece? (She’s performing and signing CDs Saturday in Claremont.) I think it works as a column — if not, it’s not Nunn’s fault, as she was engaging, relaxed and funny — but you can be the judge. Sunday’s column is about the late musician John Harrelson, who has inspired three events this week in Claremont: a screening of Harrelson documentary “Dead Man Rockin’,” a tribute concert at the Folk Festival and a release party for a new CD of a live performance from 1995. 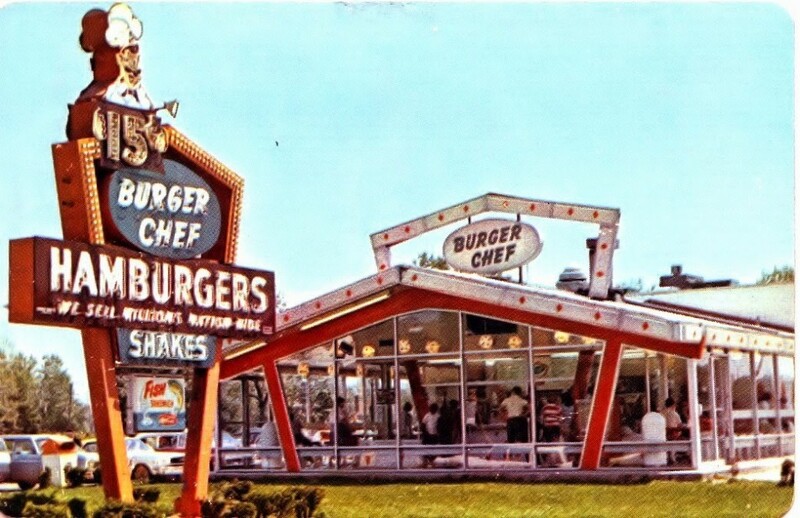 Friday’s column resurrects a bit of hamburger history (the best kind of history?) to talk about Burger Chef, which reappeared courtesy of the 909 in an episode of “Mad Men.” After that is an item about my vacation in St. Louis (the St. Tropez of the Midwest?) and a few Culture Corner briefs. 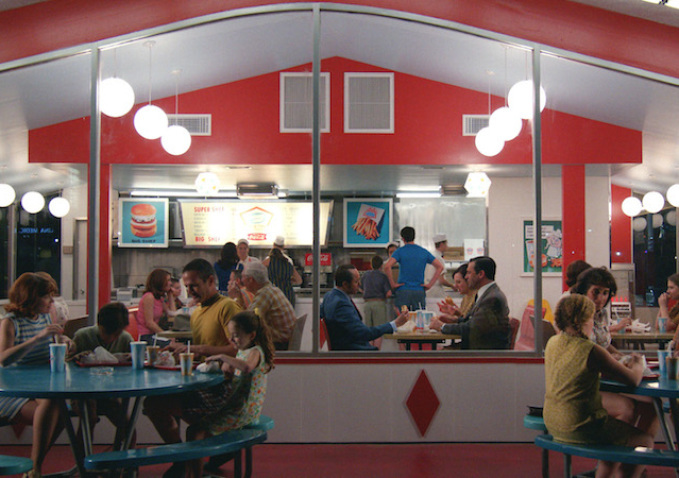 Above is Burger Chef as it appeared on “Mad Men,” from the site IndieWire; below is a vintage Burger Chef, location unknown, from the French Fry Diary blog. Step inside the Brick, which opened in February, and you might not believe you’re in Pomona. It’s a convenience store stocked mostly with organic and specialty products. Quinoa, organic salt, wasabi peas, bottled root beer and Newman’s Own products fill the shelves. Paper and cleaning products are Seventh Generation brand. This might be the only place in Pomona where you can buy biscotti. 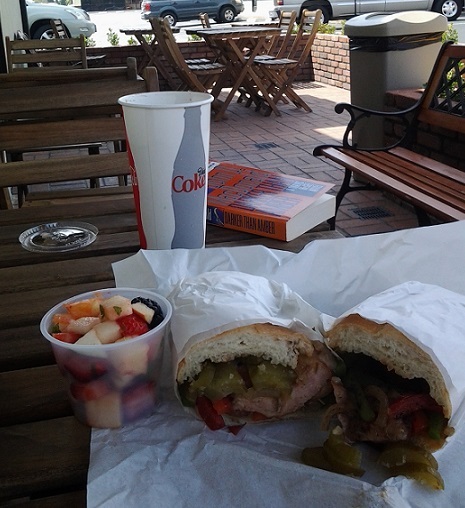 Next visit I got the sausage sandwich, which came on an Italian roll with monterey jalapeno cheese and grilled peppers and onions, this time with a fruit salad as my side ($8.50 as a combo with drink). 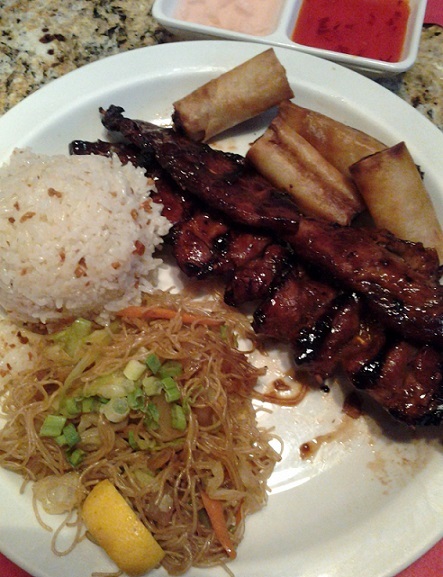 Good, if not as satisfying as the pork, and the fruit cup had a nice variety. 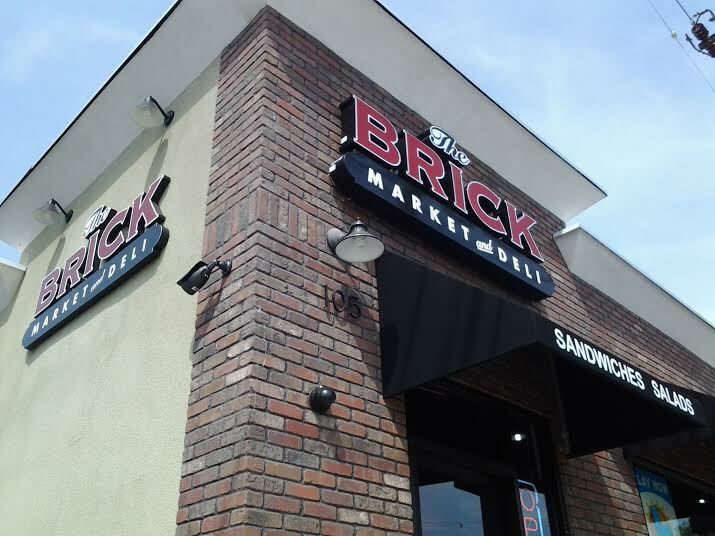 The Brick has free wifi and they’re active on Twitter, Facebook and Yelp. They seem like a smart, sophisticated bunch, the kind of business you’d expect to find in Claremont and thus great to see in Pomona, even if the location, by fast food row, is a pleasant surprise. They seem to be making it work. 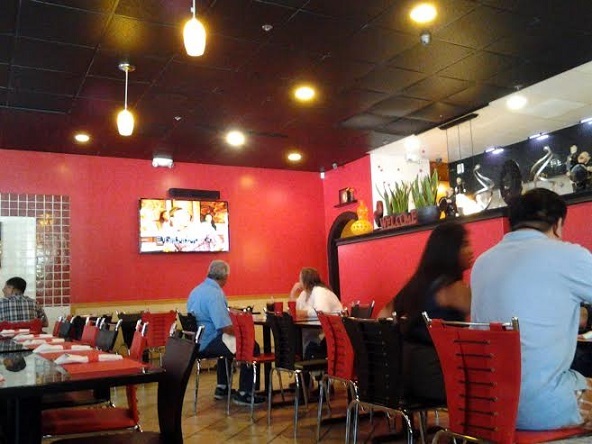 There is very limited seating inside, only one table on my first visit, with a second one added by my second. But there’s a cute patio out back, shaded by the building, with a view of the next-door drive-thru for Johnny’s Hamburgers. 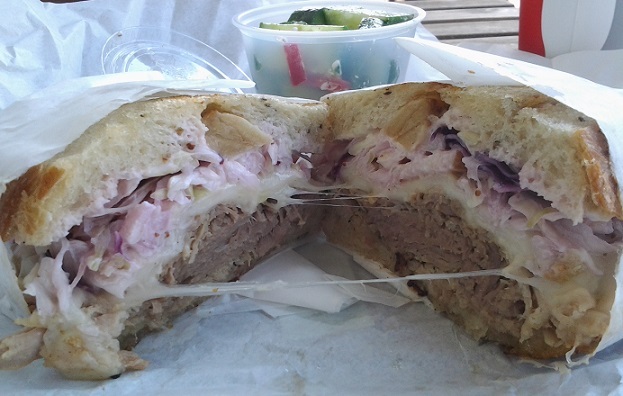 Nothing wrong with Johnny’s, but you’ll be glad you’re at the Brick. 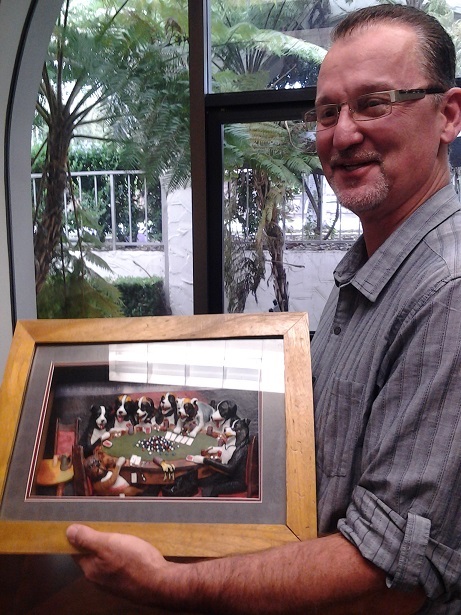 Then came reader Bob Terry, who dug up a “Dogs Playing Poker” 3-D piece of, er, art from his garage, left over from his days as a salesman for Novelty Inc. Terry gave the piece to me and I presented it to Dunn a couple of weeks back. He promised to hang it if the City Council lets him keep his job. Neither of us are holding our breath on that. 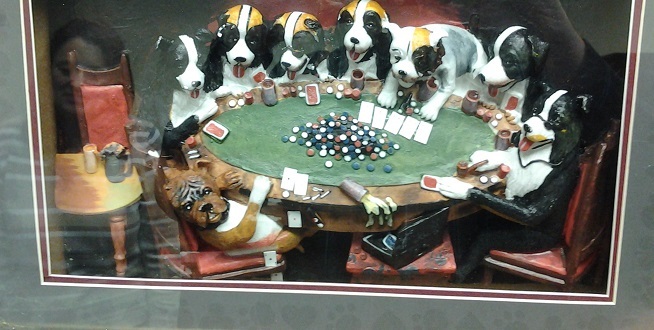 It’s hard to tell from my photo, but rather than a painting, the piece is at least an inch deep and contains figures of the dogs and tables, all handpainted, behind the glass. Let’s see the Getty match that! 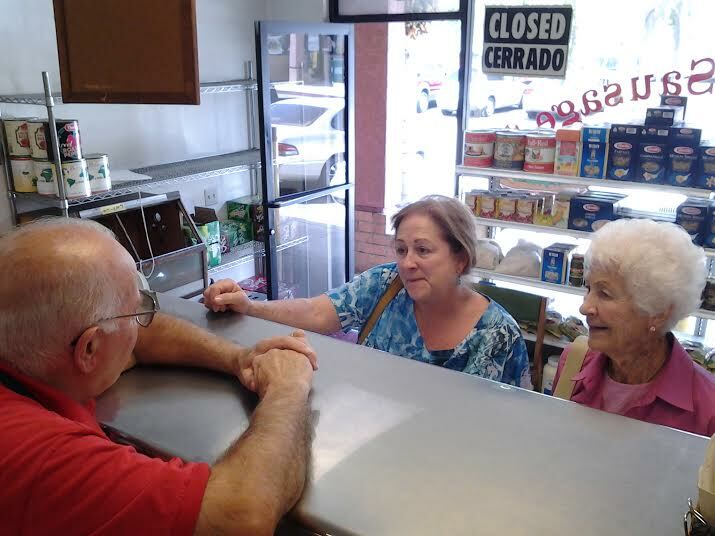 I got to spend some time with Guido’s Deli proprietor Guido Sciortino on Monday, watching him work, seeing him interact with customers and asking questions when no one was waiting. The sign says Guido’s Pizza but everybody calls it Guido’s or Guido’s Deli, since he hasn’t made a pizza in years — one of the quirks that made this story irresistible. 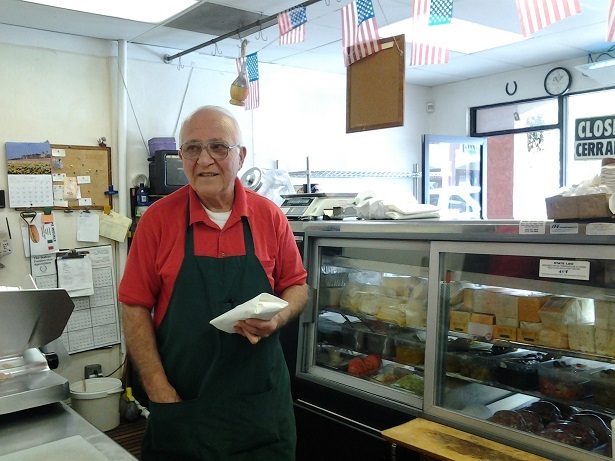 He’s retiring May 31 after some 57 years of serving customers at Guido’s and his earlier post at Santolucito’s. You can read about him in my Wednesday column. Below, Sciortino talks to Anita Schroeder and her mother, Marian Michael, whom he’s known for decades. Schroeder was soon wiping away tears. 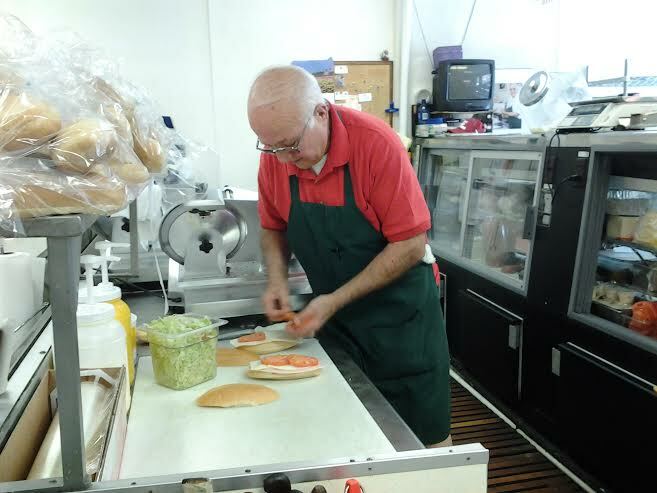 Below that, Sciortino assembles a sandwich for a customer. 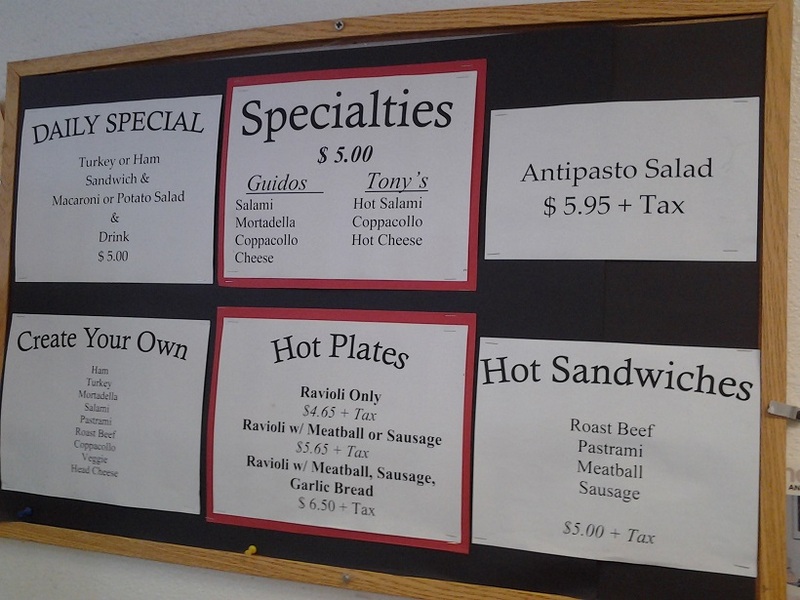 At bottom, the Guido’s menu; click on the photo for a larger view. Also, you can watch a short video of a customer interaction. My vacation trip home to the Midwest went well and I arrived back in Claremont on Saturday night. My first outing was Sunday morning, when I stopped at an ATM in the Village. “Are you back from vacation?” a stranger (or at least a reader whom I didn’t immediately recognize) shouted from his car at a stop sign. I whirled and, surprised, said yes. 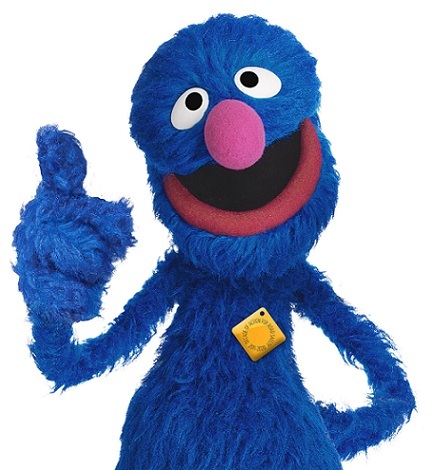 “Good! 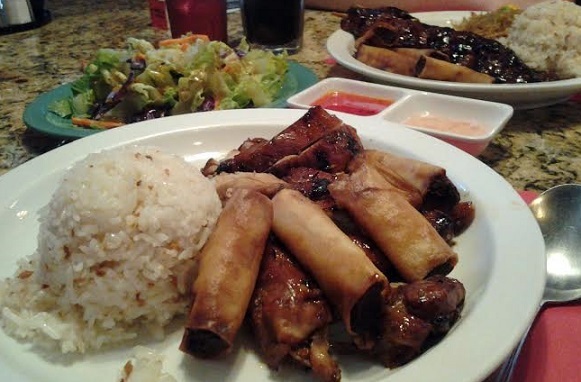 Looking forward to your next restaurant review!” he said before turning the corner. His companion in the passenger seat must have asked what that was about, because I heard him say my name to her. I can’t ask for a much better welcome back than that — a greeting from a reader of this blog, the only ones who knew I was away, moments after first stepping out.